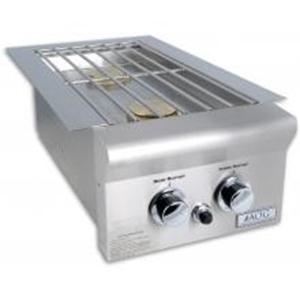 Full Description: American Outdoor Grill Drop-In Natural Gas Double Side Burner: This AOG, American Outdoor Grill, drop-in natural gas side double burner features 304 series stainless construction, 2 brass burners producing a total of 30,000 BTUs and stainless grate. No insulated jacket required for combustible installation. This side burner comes with a Natural Gas to Propane Conversion fitting kit. Built-In opening required (in inches): 8 1/2 H x 12 W x 22 3/4 D.